The very first coin-operated vending machines were built in London in the early 1880s and these first machine sold postcards. The first vending machines in the United States were built in 1888 and sold chewing gum on train platforms in New York City. Since then vending machines have exploded in popularity and there is no place in the world where vending machines are more popular than they are in Japan. 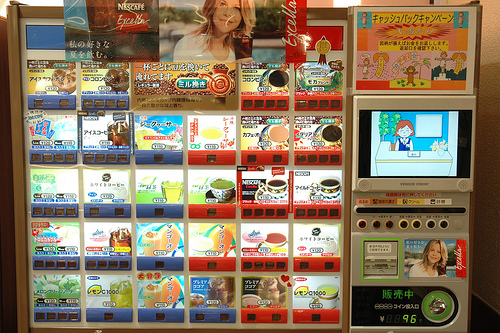 In the United States we see vending machines almost everywhere we go but Japan has about twice as many vending machines as the United States. That's a very interesting statistic when you take into account the fact that the United States has nearly 3 times as many people as Japan. Japan has very little petty crime and vandalism and labor is both scarce and expensive so vending machines seem to be a perfect way to sell products. These coin-operated salespeople provide affordable merchandise in a very convenient manner and you really can buy almost anything from a vending machine in Japan. What do the Machines Sell? 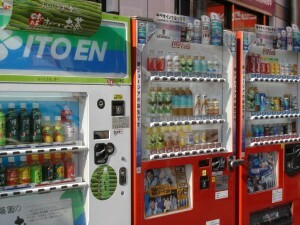 Japanese vending machines have all of the same types of things that people in America might expect to see. Things like newspapers, candy, snacks, soft drinks etc. There are also things that are not unheard of in America but are much more common in Japan such as cigarettes, Cup o Noodles soup, hot meals etc. But in Japan you can also find a host of other items, almost anything you can imagine. There are Japanese vending machines that sell eggs and vegetables like you would see in a supermarket in the US. There are vending machines that sell Japanese beer and sake thanks to an ID card system that came out in 2008 and gave machines a way to verify a customer's age. There are even machines that sell umbrellas, underwear, flowers, sneakers, neckties the list goes on and on. 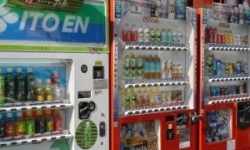 Japanese vending machines sell an incredible variety of products and provide easy access to consumer items and the popularity of easy access to affordable items seems to be catching on. Vending machines that sell things like electronic gadgets and fresh food are popping up in various places around the world but it's going to be a long time before any place has more per capita vending machines than Japan. The Japanese persimmon or Kaki Persimmon, also known as an Oriental persimmon, is an attractive tree known for its ease of care as well as its hardiness.